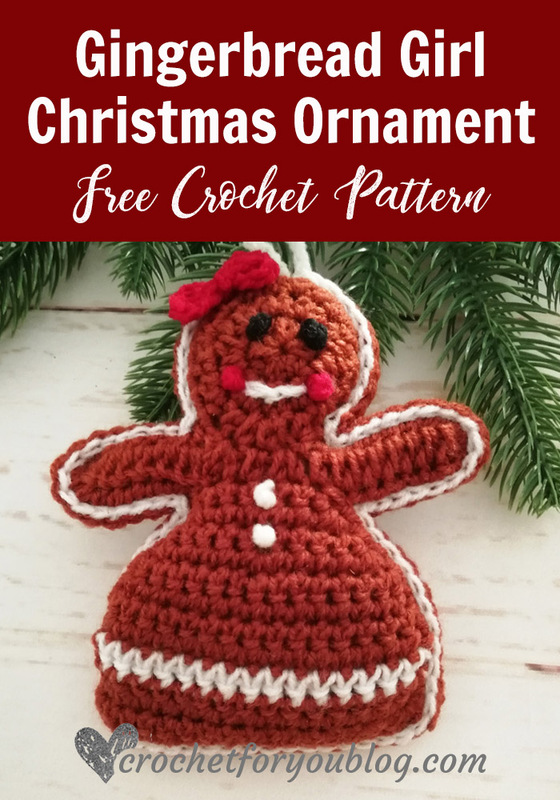 Crochet Gingerbread Girl Christmas Ornament Pattern by Crochet For You. So sweet & so cute! 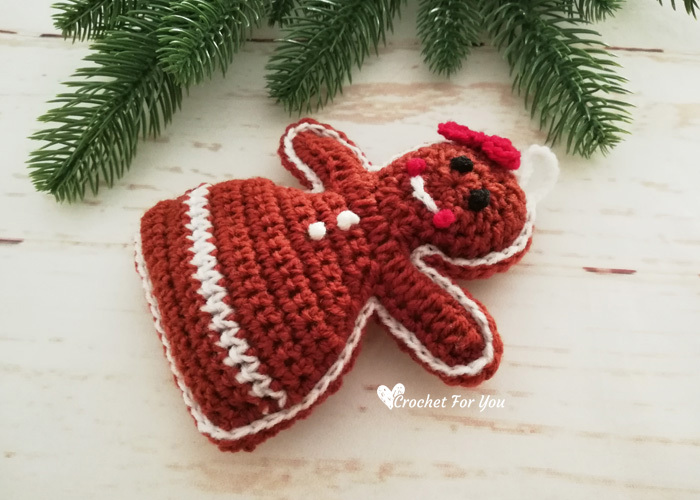 The 3rd pattern of #XmasOrnamentMiniCAL is a cute little Gingerbread Girl. 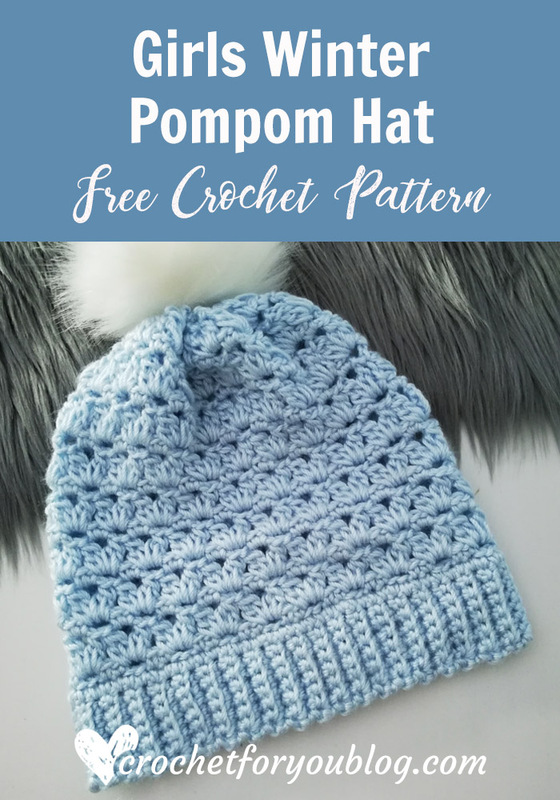 😀 It is simple and easy to crochet. 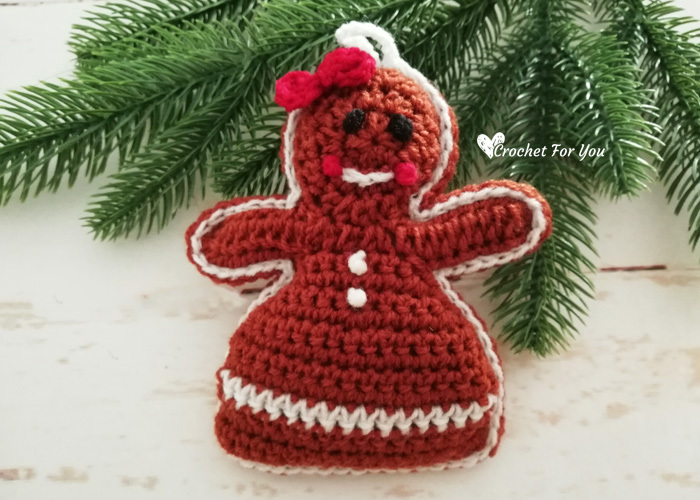 When I thought about crocheting gingerbread ornament I decided it would be a great idea to make a Gingerbread girl than gingerbread man. 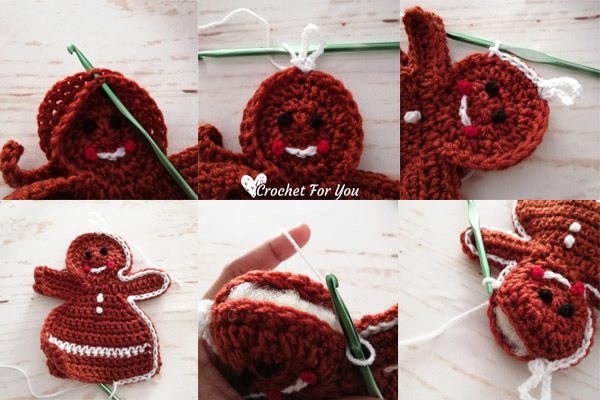 Because I’ve seen lots of beautiful crochet Christmas ornaments of gingerbread man out there and they are so cute, too. 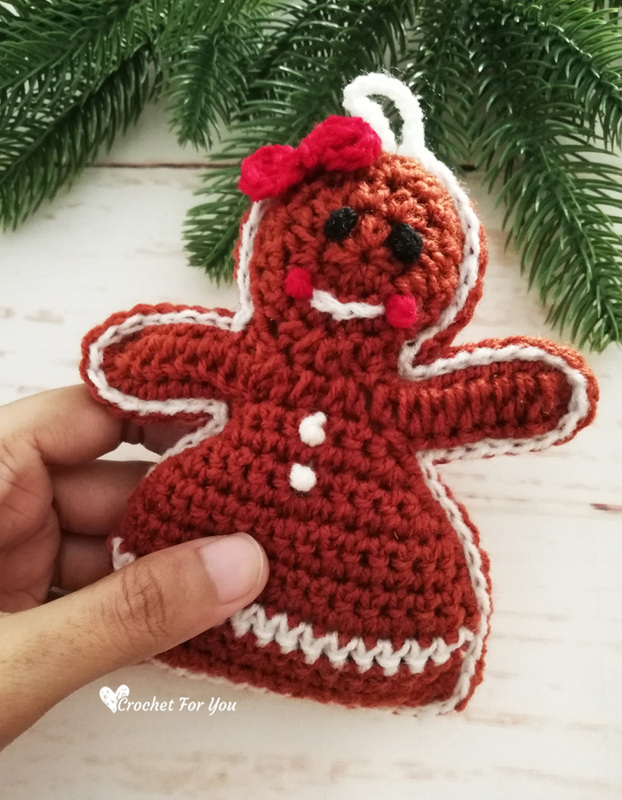 I hope you enjoy this Gingerbread Girl Christmas Ornament and make one or few for your Christmas tree. 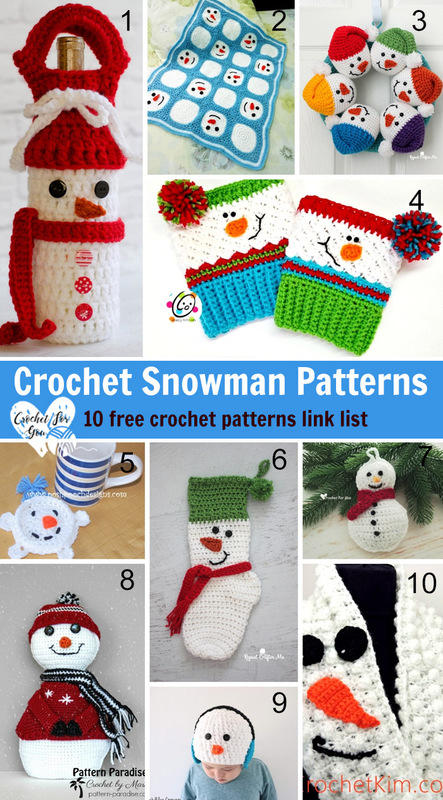 And don’t forget to make snowman and mittens pattern I shared last weeks. 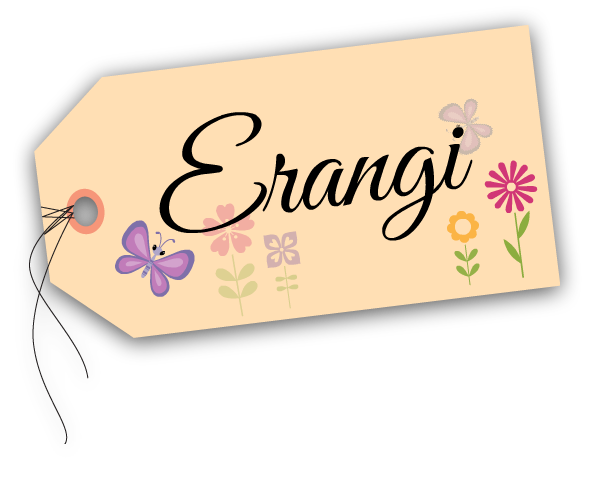 Be sure to tag me when you post your finished project on Instagram @erangi.crochetforyou. 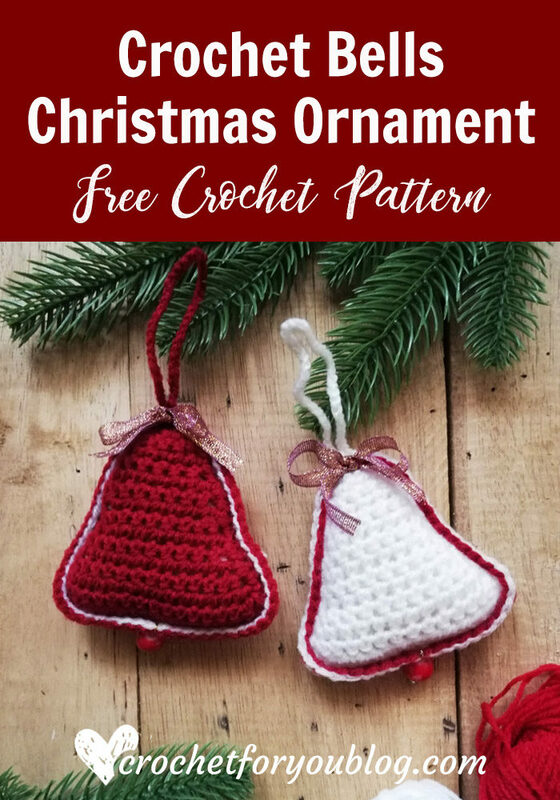 Use the hashtag #XmasOrnamentMiniCAL , #crochetforyoublog. If you are interested in this CAL…. Click here to for the Intro post. 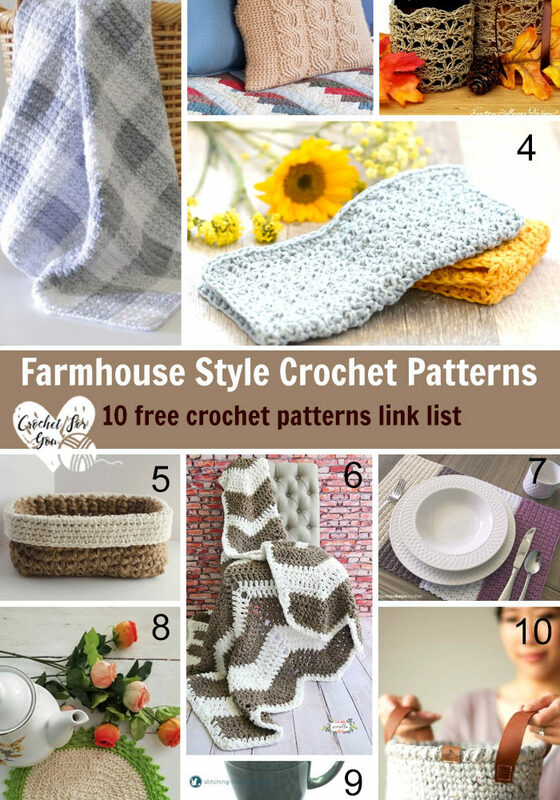 Like Crochet For You FB page. *to; = repeat * to the instructions. Gauge is not very important for this pattern. Less than 50 yards required for this pattern. With brown color make an adjustable ring/magic ring. Row 8 to 9: repeat row 7. Row 10: repeat row 7 with white color. 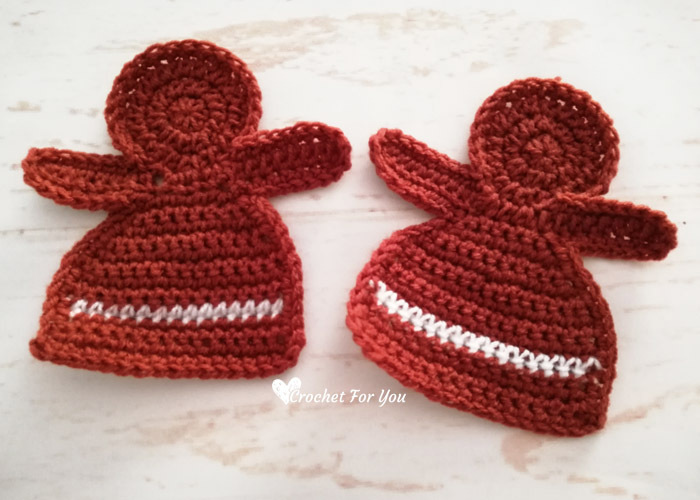 Cochet sc in each st around the gingerbread girl. To make a smooth edge crochet 3 sc in each corner st at two sides of the bottom of the body and arms, sl st to the first st. Fasten off and weave the ends. 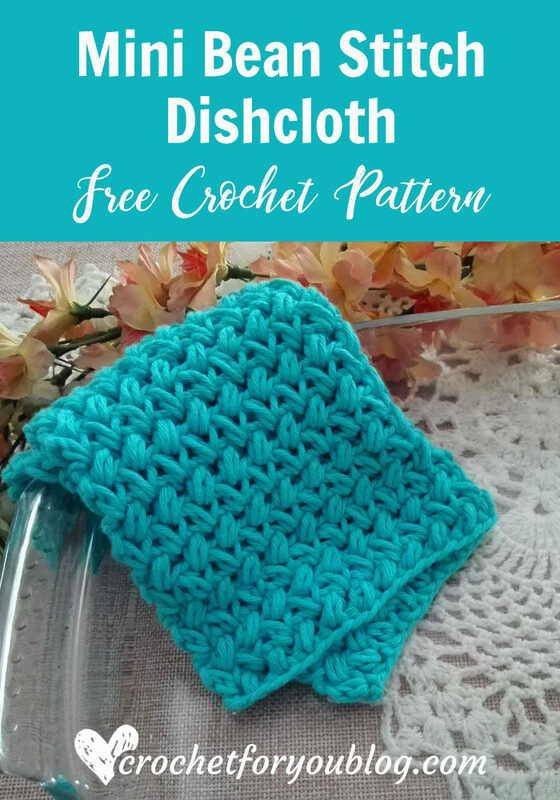 (do not forget to crochet the same number of stitches on both pieces). 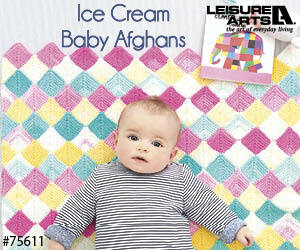 Eyes, gingerbread cheeks & buttons: using white, black, red color yarns and the tapestry needle. 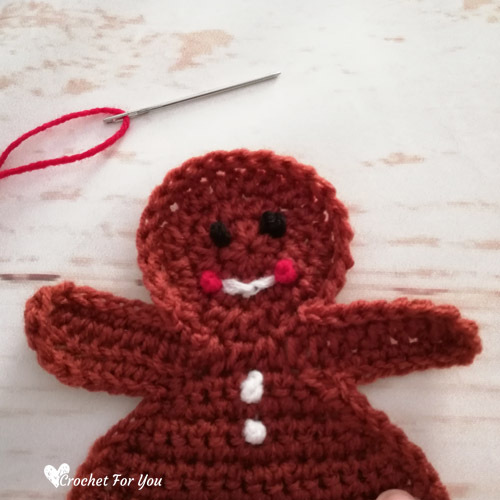 2 french knots for eyes, 2 french knots vertically on the body, 2 french knots for gingerbread cheeks. 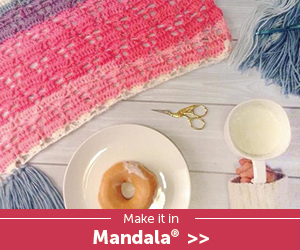 Mouth: using white color yarn and running stitches. Holding two pieces together right side out, with white color yarn begins with sc at the top of st of the gingerbread girl, ch 12, sc in same st (made a loop), crochet slip stitch (sl st) around the edge on both pieces, add fiberfill while joining. Don’t forget to fill lightly. Fasten off and weave the end. ch 3, 2 dc into the ring, ch 3, sl st to the ring, ch 3, 2 dc into the ring, ch 3, sl st to the ring, cut the yarn leaving 5″ long yarn tail, fasten off and weave the end. 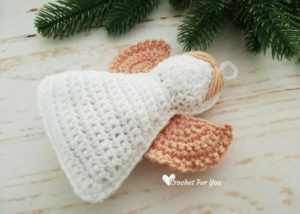 Sew the bow on the head using yarn tail and the needle.